Or is it chewed, feels a bit of both. I went back to work yesterday, and Suzanne starts her new job tomorrow. Gone are the days of waking up in our wee van to sounds of parrakeets chirping away in their rainforest paradise, the ocean majestically crashing against the reef and the thought that all we had to do that day was either go swimming amongst the turtles or travel to some other little pocket of wonder up the coast as yet unvisited. Well. We have the sounds of the city now as our morning alarm, and new challanges and all that. The company I am working for have some really interesting work on and seem a really nice buch of people. 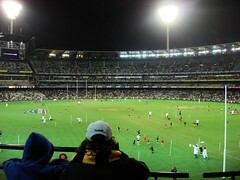 We have just recovered from Suz’s bro David visiting for a week, had a great laugh and went to our first AFL game in the MCG here in Melbourne, gone are the days of toilets at half time where you are trying to compete with 50 piss heads to piss in a trough 3 yards and 2 guys away! This place was a state of the art 100 thousand capacity stadium, and they served beer n shu mai!